An easy chicken stew is just the thing to have up your sleeve for surprise guests. Wild mushrooms and truffles make it special. 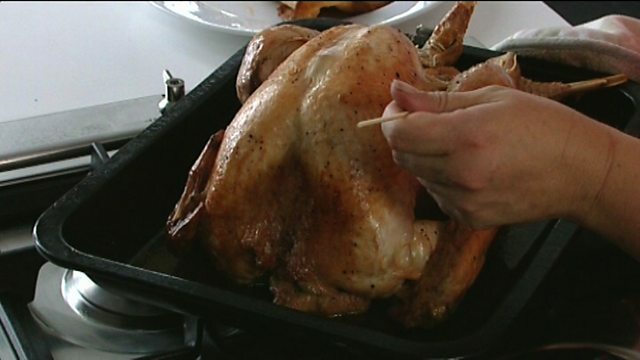 For the chicken, heat a large casserole or heavy-based pan until hot, then add two tablespoons of oil. Fry the lardons until crisp, then add the halved shallots and garlic and cook until lightly coloured. Meanwhile, season the chicken pieces with salt and pepper. Add the remaining oil to a large hot frying pan, then fry the chicken pieces until deep-golden brown on both sides.Transfer the chicken to the casserole. remove any excess oil from the pan. In the same frying pan, fry the mushrooms in the butter for 3-4 minutes, or until softened. Add the Madeira, chicken stock, cream and tarragon. Season to taste with salt and freshly ground black pepper. Pour the sauce over the chicken, cover and simmer for 15-20 minutes, or until the chicken is cooked through. For the mash, place the potatoes into a pan of salted water, bring to the boil and cook for 10-15 minutes, or until tender. Drain the potatoes, then return to the pan and gently heat to get rid of any excess moisture. Remove from the heat and mash with the butter and cream until smooth and creamy. Season, to taste, with salt and freshly ground black pepper. Set aside and keep warm. To serve, pile the chicken in a serving bowl, cover in sauce and shave over the truffle, if using. Spoon the mash alongside.